Thanks for the very cool photo of a Sphecious female making her way back to her burrow with a paralyzed cicada. The species - judging by the large black band on the abdomen and the pinkish opercula (those things that look like lungs) are indicative of a species of cicada known as Tibicen lyricen. Very cool. Thanks very much for the datapoint, I will add it to my database. This one was captured by another "killer" - my cats!. 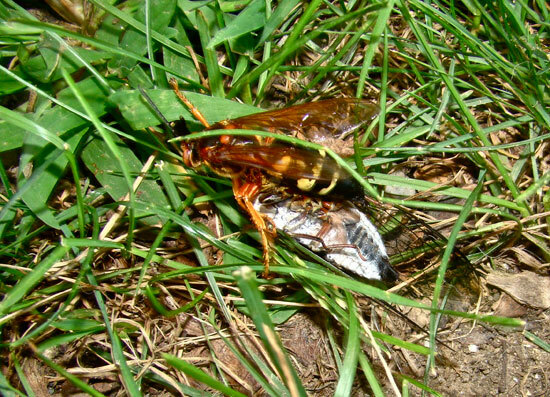 But I was talking just the day before to a friend who was telling me about cicada killer wasps digging up her lawn and she was the one who made me think that this (ugly) mystery bug I had found the week before was a cicada. She lives in Brookfield, CT.